A new Jackie Kennedy biopic is one of the year’s best movies. Check out our Jackie review below to find out why. Jackie is one of the most unique historical biopics I’ve ever seen. 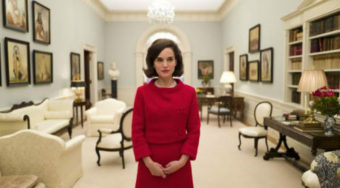 The film is about First Lady Jacqueline Kennedy but it never attempts to tell Kennedy’s whole story. Instead, sildenafil it focuses on a defining period in her life — the days following the assassination of her husband. The drama never settles into a traditional biographical format and is more jarring and unforgettable because of that. 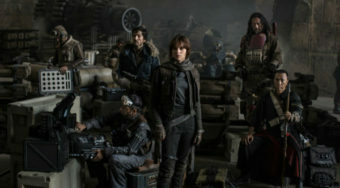 Natalie Portman stars as the title character. In the film’s opening moments, viagra dosage the character — a widow for only a few days — opens the door to speak to a reporter. She is defensive but tough. Her pain is evident but she never allows herself to become a victim, instead opting to question the veracity of the newspapers she’s seen. “I’ve grown accustomed to a great divide between what people believe and what I know is real,” she says. In telling stories from her own perspective, the movie flashes back to key moments in her life. Her televised tour of the White House. The ill-fated trip to Dallas. Her growing frustrations about her late husband’s funeral arrangements. In each of these situations, the viewer sees a different side of the First Lady. Oscar winner Portman brilliantly attempts to capture the First Lady’s pain and anguish in these settings. The actress conveys her character’s emotions oftentimes without saying a word. Director Pablo Larraín brings the camera in for innumerable close-ups where Portman’s performance carries the movie’s heavy weight. In these close-ups, we see Jackie emotionally witnessing a performance in the White House, dramatically telling the story of her husband’s death and wiping away blood from her cheeks. Such scenes show Portman’s incredible ability to capture a woman that the public only thought they knew. Larraín makes some distinct filmmaking choices here — never settling to tell a straightforward story. Instead, his choices (the haunting score that strikingly keeps viewers off guard to the editing between the distinct time periods) keeps the audience anxiously awaiting the next scene and a little off-guard. Sometimes the loud score gives way to great silences. 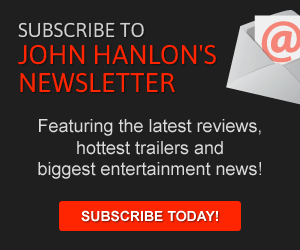 This isn’t a movie that will let viewers settle into their seats. It’s an unsettling and oftentimes jarring film that tries to convey the emotional turmoil both the First Lady and the country were facing during this turbulent time. Portman leads the cast but this is ultimately an ensemble picture that involves an incredible group of actors and actresses. Greta Gerwig plays Jackie’s irreplaceable assistant Nancy Tuckerman who stands by Jackie in all of her times of trouble and anxiety. Caspar Phillipson, Peter Sarsgaard, and John Carroll Lynch respectively play John Kennedy, Robert Kennedy and Lyndon Johnson — three politicians who stand in the background as Jackie’s story unfolds. 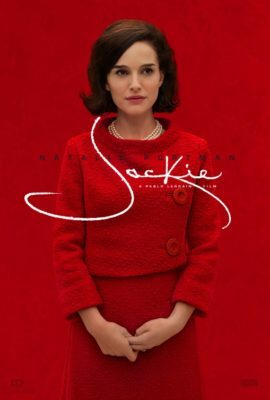 This movie is ultimately the story of Jackie but it captures more than her incredible journey. It captures a time and place in history where the public was blindsided by so many troubled events. The 35th President was gunned down in an open vehicle while his killer was murdered on live television shortly thereafter. The 36th President was inaugurated in an emergency ceremony onboard Air Force One. No one knew what threats the country was truly facing. There was heartbreak, confusion and anxiety about what was happening and few answers. Here, the script by Noah Oppenheim captures all of these feelings while shedding light on the First Lady’s anguish and determination during this hellish period. Jackie isn’t traditional and works so powerfully because of it. Nothing about the story of the rise of Camelot and the fall of a president seemed normal. In telling Jackie’s story, this movie shows the First Lady’s anguish and pain as she lost the love of her life and the country lost its iconic leader. Interested in more stories about First Ladies? Click here for a list of 5 other First Ladies who deserve their own movies.